Scientists have discovered a novel kind of stem cell that could one day generate cells and tissues for any kind of organ in the human body – a development that may potentially help the 30 Americans who die every day due to a shortage of organ donors. 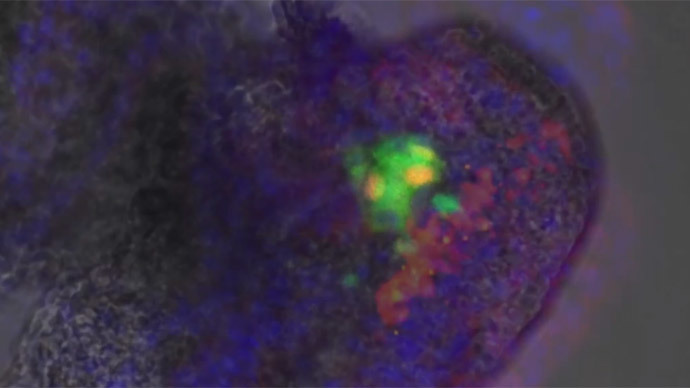 The news comes courtesy of a new study from the Salk Institute of Biological Research, in which scientists said a new stem cell called pluripotent is capable of developing into any type of tissue. Traditionally, stem cells used in scientific studies are characterized by their stage of development, but in Salk’s discovery, researchers found a way to trigger early-stage development in human stem cells towards making tissue. This means they could potentially be cultured for specific uses. “These region-specific cells we found could provide tremendous advantages in the laboratory to study development, evolution and disease, and may offer avenues for generating novel therapies,” said Salk Professor Juan Carlos Izpiusa Belmonte in a press release. Belmonte, who is senior author of the paper published in Nature, said that to produce the stem cells, or “region-selective pluripotent stem cells”(rsPSCs), scientists developed a combination of chemical signals that directed human stem cells in a laboratory dish to become spatially oriented. These were then inserted into a neutered mouse embryo in a laboratory dish and cultured for 36 hours. For a comparison, they also inserted the new stem cells using conventional methods. Using the traditional method, the novel stem cells failed to integrate into the modified mouse embryo, but the human rsPSCs began to develop into early-stage tissues. The cells at this level undergo dynamic changes that give rise to all cells, tissues and organs. Scientists saw that the rsPSCs began differentiating into the three major cell layers – ectoderm, mesoderm and endoderm – seen in early development. Belmonte said they stopped the cells from differentiating further, but the germ layer was theoretically capable of giving rise to specific tissues and organs. With improvements in technology, it may be possible to generate human cells, tissues and organs in another species, such as a pig, which could then be used for human transplant. “Of course, the ethical implications behind creating a human-animal chimera for the purpose of obtaining human tissues and organs to save lives of millions need to be carefully evaluated,” said Belmonte, according to the Verge. According to Wu, the rsPSCs are more favorable for laboratory manipulation than previously isolated stem cells, since they feature high cloning efficiency, stable passage in culture and ease of genetic engineering. “All of these are advantages for applications in research and, potentially, scaling up for clinical applications,” George Daley, a stem cell biologist at the Children’s Hospital Boston and Harvard Medical School, told The Scientist.